The long-awaited book documenting the history and impact of The Rivington School is finally on its way to publication after 15 years of starts and stalls. As some of you already know, Linus Coraggio spearheaded the creation of a massive morass of a welded steel installation at the corner of Rivington and Chrystie streets on NYC's Lower East Side in the mid-1980s. Known simply as The Sculpture Garden, it attracted hundreds of other artists during its 7-year run, birthing a movement that came to be known as The Rivington School. The site and the movement garnered much media attention during the peak of the over-hyped East Village art scene against which the Rivington School stood in contrast as a bold, grimy bastion of true Bohemia gone wild. 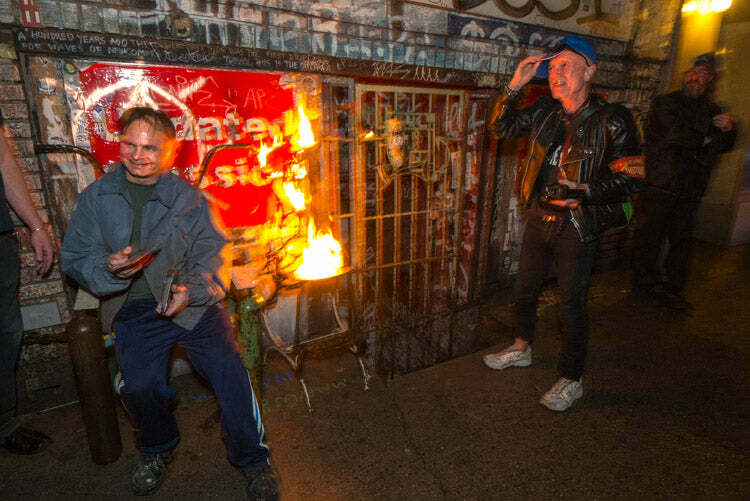 On August 21st, 2014, artist Monty Cantsin—fresh from his arrest and brief stay at Bellevue after a guerrilla performance piece at the Whitney museum the day before wherein he painted some Rivington School graffiti inside the Jeff Koons show using his own blood (click here for more on that)—came by Coraggio’s studio to examine some photos for possible inclusion in the book. The two also discussed topics that Coraggio will include in a lengthy “self-interview” planned for the book. Among those topics are how The Sculpture Garden got started, what was its driving aesthetic, how women interfaced with the macho atmosphere, and a short bit about the “son of Rivington,” a.k.a. Linus Coraggio's Gas Station/Space 2B. The book is due out in May of 2015 and promises to be an action-packed 300 pages—all except the cover, which will be in dazzling black-and-white.